Munich - After helping FC Bayern München win the DFB Cup and secure their tenth last weekend, Franck Ribery was only too happy to spill the beans on a season in which the highs undoubtedly outweighed the lows. bundesliga.com: Franck Ribery, what did you make of the 2013/14 season? 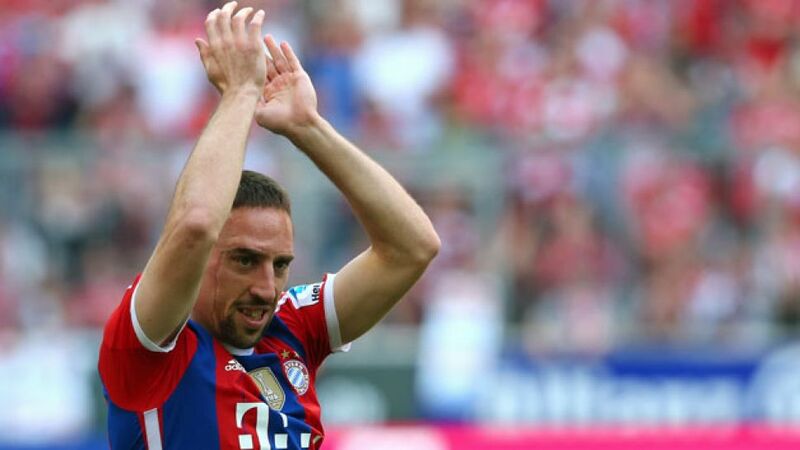 Franck Ribery: At the end of the day, it was a really good season. We won the Bundesliga title - and earlier than any other team at that. We racked up some unbelievable results, stretched our unbeaten run to 53 matches and were unbeaten for the first 28 games of the season. We played attractive football, too. Then, after a convincing performance against Borussia Dortmund - our fiercest rivals in Germany - we lifted the . We got to the semi-finals of the Champions League and lost to Real Madrid, who are one of the best teams in Europe so there's no shame in that. Let's not forget, we also beat Chelsea to win the and we won the . That's four titles! In that sense, I'm really pleased with the season. bundesliga.com Prior to the DFB Cup final, you said how if you lost to BVB it would have been a poor season. Why? Ribery: Because up until the end of March we'd played the perfect season and were on track to break all manner of records. Then we hit a sticky patch. We wanted to lay down a marker by winning the double and ending the season on a high note. We succeeded. bundesliga.com: What was your standout moment of the season? Ribery: When we won away at Manchester City in the Champions League. That was football at its finest. We completely controlled and dominated the game. It was on City's own patch, but they had no chance. I had so much fun that night. Apart from that, the way we played up until the end of March with our unbelievable will and combination play was superb. Our fans certainly enjoyed it. bundesliga.com Why didn't it go quite as smoothly after you wrapped up the title? Ribery: We actually wanted to finish the season as the first German title winners to go an entire campaign unbeaten. Unfortunately, we couldn't do it. We definitely slackened off and then focused pretty much exclusively on the Champions League. We lost a bit of our rhythm, which is why it was even more important to round off the season with a win. bundesliga.com Which game or result hurt the most? Ribery: Definitely the 4-0 defeat to Real Madrid in the second leg of the Champions League semi-finals at the Allianz Arena. Before the tie, there was a fantastic atmosphere in the camp, we were all really pumped up for it and really wanted to make the final. The defeat was like a slap across the face. We made too many mistakes. You get punished for those in the semi-finals of the Champions League, but that's what football's like sometimes. We dusted ourselves down immediately and showed our spirit. Ribery: First, I'm going to rest up for three days before travelling to Paris to meet up with the national team. Even though I came on and then went off again last Saturday, I'm feeling much better after spinal disc problems. I'm looking forward to my third World Cup.